Not much knitting here beyond finishing up the gift socks mentioned yesterday, which later today will be given to the target recipient. 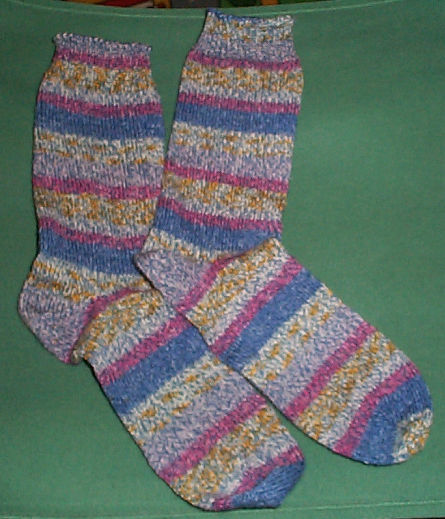 I also posted a yarn review for the Schoeller/Stahl sock yarn I used. (Please consider leaving reviews of your current yarn yourself, as a holiday present to fellow knitters worldwide). I can in the spirit of ecumenicism born of our happy, culturally jumbled household recommend two non-knitting related holiday hacks. First for Hanukkah (and Kwanzaa): Every kid is fascinated by the candles used in menorahs and other holiday candle holders. They burn quickly, and often being close together, act on each other to make strange melting patterns and drips – especially when “encouraged” by the viewer. And every kid who grew up with a menorah in the house will either admit to performing said encouragements, or by virtue of being watched constantly, not having the chance to do what he or she really wanted to do. But not every parent can hover over the candles for the entire time they are lit for eight nights straight. Now devices are no substitute for parental supervision, but accidents happen in even the most careful household. Place your menorah on a shallow lipped pan (like an inexpensive jellyroll pan or in my case – the liner pan that came with a now defunct toaster oven) and fill the pan with about a quarter inch of water. Drips will fall into the water, and won’t weld the menorah to the table or counter top. Should your offspring be too helpful and a candle come loose from its moorings – it will fall harmlessly into your mini-reflecting pool and be extinguished. Second for Christmas trees: Fighting one’s way underneath the lower branches to water the thing is a major pain. I cheat. I float some packing peanuts or crumpled aluminum foil on top of the water so I can see the level while still standing. I also take a tube or pipe (in this house, the unobtrusive brown extension tubes from our upright vacuum cleaner) and wedge them into the tree holder’s bucket area. I use some twist-ties to anchor the tube against a branch. The tube remains there as long as the tree is in the house. Then when watering time comes, I take a watering can and pour into the tube until I see my floating markers rise. No bending, no needles in my hair, no overflows.